The NASCAR Whelen Southern Modified Tour drivers had a quick turnaround this past weekend. After competing in the combined show with the Northern boys at Martinsville on Saturday, the series made the trip to Ace Speedway in Northern North Carolina to compete in twin 100 lap events on Monday. The twin 100-lap races were the combination of a regularly scheduled show on the Tour schedule, along with the makeup of the earlier race at Ace in the year which was rained out. The twin 100 format would actually count as two separate races, but the first race would determine the starting order of the second. The top-eight finishers in the first 100-lapper would redraw for starting positions in the second race, with the rest of the field falling in line with how that finished in the first one. The races proved to be quite interesting, but in the end, it was no surprise who came out on top. Burt Myers, who came into the night second in the points to Junior Miller, grabbed the pole and pulled the number two pill, putting him on the outside of the front row for the start of the first 100-lapper. Michael Clifton started on the pole, but that is when the drama started. Before the race ever began, Clifton pulled off into the pits and never took the green. The #50 car fell victim to a power steering problem. That moved Jason Myers up one spot and to the inside of his brother Burt for the start of the race. However, Burt wouldn’t let his younger bro even get a taste of the lead. Burt jumped to the front on the first corner and led all 100 laps of the event, en route to taking his third win of the Southern Modified Tour season. It didn’t come easy though, thanks to the front bumper of one of the best in the business… Ted Christopher. 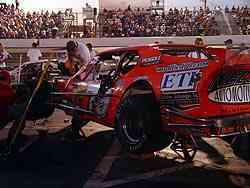 point of the race, TC made several charges at Burt’s #1, often laying the bumper to him. Each time, Burt got sideways, shook his hand at TC, but kept the car up front. As the race wore on, Burt slowly pulled away from TC, allowing for a cruise to the checkers. “We had a heck of a racecar from the get-go,” said Burt Myers. “We came here and tested a couple of weeks ago and ran about 20 laps and came in. The guys asked what the car needed and I said just new tires. The car handled really well. We came with basically our Stadium setup. “I’ll tell you, Ted gave me a couple of good shots. That is the way I like it. When you take a couple of good shots like that and you took the best of what he’s got and you still win the race, it makes you feel pretty good. Michael Clifton was suppose to start from the pole, but pulled it in before the green with power steering problems. “After the weekend we had at Martinsville, it feels good to put the Dirty South car in Victory Lane here. Once Burt got a comfortable lead, it was still a battle between Myers and TC, but this time, it involved Jason. Jason sat in third much of the race and kept his tires cool, waiting for a shot. With about 10 to go, he made a move of TC, trying to make it a Myers one-two finish. The two charged to the line in a near dead heat. 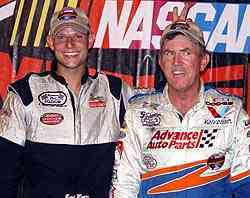 No one was sure who finished second, until NASCAR announced TC had gotten it by a mere matter of inches. For TC, second was great, but had the team not experienced problems earlier in the day, he might have had a shot for the win. Brian Loftin, who started 13th, finished fourth, with Alex Hoag rounding out the top-five. With the win in the first 100-lapper, Burt Myers retook the points lead in the Southern Modified Tour by just six points over Junior Miller, who finished ninth in the first event. Things just kept getting better for Burt, who drew the number one pill for the second race, putting him on the pole and the favorite to make it two in a row. However, outside Myers was Loftin, who made a huge charge from the back of the pack to finish fourth in the first race. At the drop of the green, Myers once again got the jump and put himself out front. He paced the first 65 laps of the event, but behind him, two cars were charging to the front. First was Miller, who started ninth and quickly found himself in the top-three. 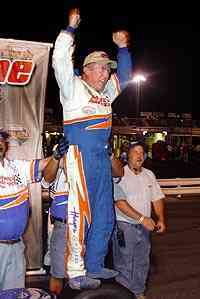 He then dogged Myers for the race lead. Behind Miller came Clifton, who had to start dead last, but worked his way into the top-five and eventually the top-three as well. 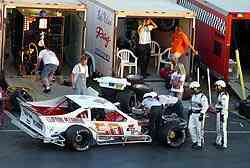 The #79 crew works on the car in the fading sunlight at Ace Speedway between races. 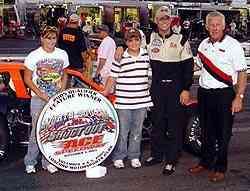 With his win, Myers earned himself a spot in the North South Shootout. Miller was the driver who looked like a man on a mission though. And fitting it was that the two most loved and hated men of the Southern Modified Tour drivers and the two drivers dicing it out for points' title, Myers and Miller, found themselves battling in front of a great crowd at Ace Speedway once again. Miller laid the bumper to Myers on lap 65, grabbed the lead on lap 66, and pulled away, putting his #69 in Victory Lane. It also put Miller back on top of the point standings by just four points over Myers. “Stagger, stagger, stagger. That made the whole difference between the two races,” said Miller. “I had about an inch too much in the first race. We changed it and the car flew. I knew when they set the stagger that it was a good racecar. The right things have to be under the car to make it go. I know what it takes to make that car go. After the race, Myers conceded the victory to his arch rival Miller, but was happy with how everything worked out. “Aw dang. We lost our forward bite in the second race,” said Myers. “We should have probably tightened the car up a little bit more. We put right sides on the car in practice to try and get a feel for what the car was going to do in the second race cause we put right sides on in the second race. We probably didn’t get it tight enough. When Junior got to me, we were giving it all we had. Hats off to Junior. I’ll take one if he takes one. I’m not greedy. Clifton got to Myers at the end, but couldn’t make a pass and had to settle for third. Loftin and Hoag each finished fourth and fifth in the second race, just as they had in the first. Miller's victory was popular with the fans and his crew.